Dr. M. Sanjayan, host of Powering The Future, and lead scientist at The Nature Conservancy. “We are the energy generation, but we as Americans do not fundamentally understand what energy is, where it comes from, how we use it, and how much we need,” remarks Dr. M. Sanjayan, host of the new Discovery Channel four-part documentary Powering The Future. Indeed, any honest retrospective of the modern energy crisis first requires a primer reviewing how our dependence on major fuel sources (coal, oil, and natural gas) came about and the unique challenges that breaking it poses. I consider myself a fairly well-informed individual, particularly on scientific matters, but in watching the first installment, The Energy Revolution, even I was amazed at the sheer interconnectedness of major electrical grids, and how much links us globally in energy delivery vessels. A German electrical engineer in the documentary compares running a major grid to being an air traffic controller. Much of the current hope for alternative energy sources rests in grandiose ‘silver bullet’ solutions. Scientists at the National Ignition Facility are using the world’s biggest and highest powered lasers as a power source for smashing together the hydrogen atoms in a droplet of water, resulting in nuclear fusion. This mimics the way that the sun makes energy, and, if successful, would harness a limitless supply of power. Nuclear fusion research has been ongoing since the 1940s, but has never been applied successfully on a large enough scale like the undergoing experiments at the Ignition Facility. [ScriptPhD.com was recently granted an exclusive tour of the Ignition Facility, which will be covered soon in a separate post.] Another growing ‘silver bullet’ sector has been the harnessing of two natural energy sources—the sun and wind. Wind energy is the largest (and fastest-growing) alternative source of energy. 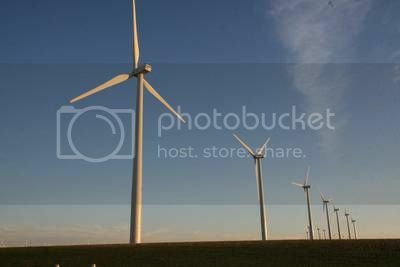 Denmark gets about 20% of its power from wind sources, while the United States gets approximately 1.2%. Photovoltaic, or solar panels, more mobile and aesthetically pleasing than wind turbines, are another popular source of alternative energy. Little money has been poured into researching photovoltaic grids as a large-scale source of energy, it holds promise. The 89 petawatts of sun that shines on the Earth each year is more than 6,000 times the 15 terawatts of electrical power consumed by human. Unfortunately, both of these energy sources face one insurmountable hurdle; their mercurial natures. Our modern lifestyles require a constant influx of power, but if the sun stops shining, or the wind stops blowing, solar and wind technologies are unreliable. 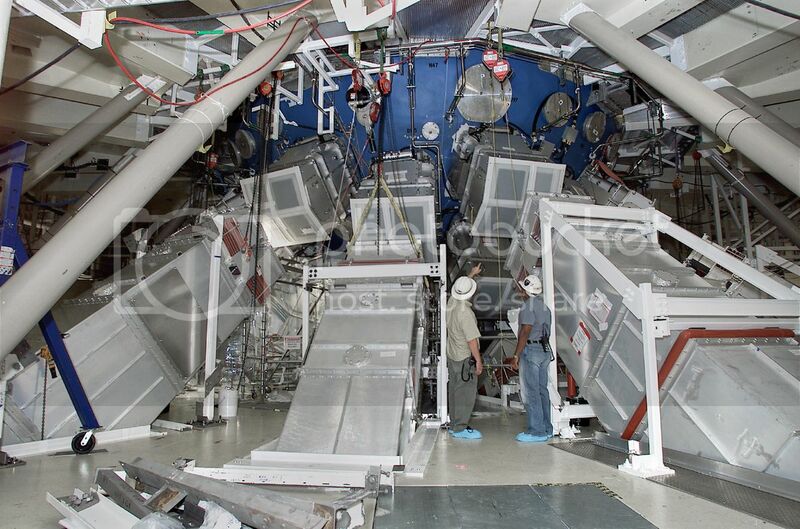 Scientists make adjustments to the enormous lasers at the National Ignition Facility in Livermore, CA. The reality is that moving energy consumption into the 21st Century will not happen with one grand discovery, but a microcosm of intermediary ones. Powering The Future provides some exciting insight into the body of research and creativity being applied to alternative energy sources. Many communities are powering themselves through clever solutions, such as Japan generating solar energy in outer space and then beaming it to Earth, or New York City harnessing wind energy from tidal waves in the East River. No role is rendered more important in this documentary than that of private organizations and academia in leading innovation and discovery. Bay Area-based Makani Power specializes in capturing and storing high-altitude wind for abundant power and energy. Caltech University solar electrochemist Dr. Nate Lewis has invented a thin coating of paint containing chemicals that catalyze the sun’s energy for power. Paint your roof, get free solar energy! In fact, just today, General Electric announced a $200 million smart grid contest for cleaner and more efficient electrical grids. The California-based X-Prize Foundation has even gotten in on the act, recently announcing a $10 million oil spill cleanup challenge. Even those that consider themselves knowledgeable about environmental issues and research and technology of clean energy will have a lot to learn from Powering The Future. The special does an exceptional job of laying out the complex science behind concepts such as fusion and large-scale electrical grids for a lay audience to understand, while not glossing over current research in industry and academia. Moreover, rather than approaching the issue with the typical heavy-laden, moribund fatalism one often finds in these specials, Powering The Future leaves one feeling hopeful about the range of innovation happening at all levels worldwide, and the remarkable commitment of both academic labs and private companies for tireless discovery. It is this very entrepreneurial, resilient, and utterly human, attitude that will power our future more than any fossil fuel ever could. Powering The Future premieres on the Discovery Channel on Saturday, July 17, 2010 at 8 PM ET/PT. Finally, we encourage you to read to our exclusive one-on-one interview with Dr. M. Sanjayan, lead scientist at The Nature Conservancy, as we expand the energy discussion of the mini-series to global solutions, his thoughts on the oil spill crisis, and ways that we can impact our dependence on fuels right now. ScriptPhD.com: Joining us today is Dr. M. Sanjayan, who is the lead scientist at The Nature Conservancy. He has a PhD from UC Santa Cruz, and is the author of “Connectivity Conservation.” His articles and appearances range from the most prestigious scientific journals to popular media such as The New York Times, and Vanity Fair and TED Talks. Thanks so much for joining ScriptPhD.com! 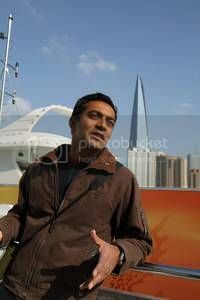 M Sanjayan: You’re welcome, thank you! SPhD: It’s impossible to have a conversation about the nexus of environment and energy without addressing the oil spill afflicting the Gulf Coast. Is it safe to call this THE environmental catastrophe of our generation? MS: Well, the generation’s not over yet. From the time of my recent memory, this has been one of the bigger wake up calls we’ve had. SPhD: Why do you feel that way? MS: It happened at our doorsteps, it is impacting a couple of industries that are hugely important to the United States. About a third of all the seafood you eat comes from the Gulf. About an eighth of the oysters you eat come from the Gulf. It’s a massive industry for fisheries and it also supplies about a third of all the gas that goes to heat up your house. So the Gulf is a pretty important place for America at our doorstep or seastep. SPhD: Well, see, there’s one of the conundrums that I feel lies at the heart of this mini-series. If we take the Gulf Coast example, our President (Obama) is certainly no foe to environmental causes, and yet even he concedes that stopping offshore drilling is not practical given our thirst for oil and energy consumption. What are your thoughts on this? MS: Well the reason that energy remains such a telling topic for our documentary is that it’s present in our entire lives. Look, I’m a pretty informed consumer and scientist, and even I was shocked at how much energy I use and all the kinds of insidious ways that energy goes into everything I do. And so if you’re looking for the culprit, in some ways, the culprit is us, it’s our thirst for big oil and it’s our thirst for this unlimited supply of energy with no repercussions, which causes us to endanger our future generations. So, it’s very difficult to point fingers when it comes to this crisis in the Gulf, even though what happened there is clearly something that BP is going to be responsible for. But once you step a little bit beyond that, you quickly realize that how we got here and what we depend on? Still fossil fuels. I mean, [this dependence] makes hypocrites of all of us, and I think that’s the hardest part about it. That’s why it’s not comfortable to talk about, and that’s why it’s so important that we have a thoughtful dialogue about it in this country. And that’s what the show tries to do. I mean, we are addicted to just one form of energy but guess what? There’s so many other forms of energy just waiting there to be tapped. But none of them are going to come without a cost. SPhD: In speaking about this mini-series, one of the things I adored about the first installment is that it really avoided the gloom and doom that you find typical in stories and shows pertaining to energy. Rather than dwelling on the enormity of the challenge posed to scientists, it actually made me feel hopeful about the creativity and discoveries that ARE actually out there already! Do you feel the same way? MS: I really do, and I think that that was a conscious decision. When you talk to innovators and the people looking for the so-called “silver bullet,” you realize that Powering The Future talks to some really excited young people who are on the cusp of making gigantic breakthroughs. It’s a really sensitive section that you get carried along with. You don’t want to avoid the consequences of what we will look like if we reach 2015 with 22 kilowatts of energy needed to power our lives and all of that coming from fossil fuels. That will be a disaster and there’s no way to spin that. But we wanted to do a show that allows you to see the possibilities. People can only deal with so much – you have to give them a positive direction. SPhD: You just mentioned the “silver bullet” – that leads perfectly into my next question. So based on your work, your travels and the research you performed in putting together this documentary, will we see the so-called “silver bullet” in our lifetimes? And if so, what are the commitments that must be made on an international level to see that happen? MS: I wish I could tell you that there was a silver bullet and that I’ve gained a glimpse of it. I was looking for it, and I wanted to see it, and I wanted to believe in the idea of it. You’ll see that in the show. The truth is it’s more like a silver buck shot. There are lots of smart people coming up with lots of cool ideas. Some of them will go into practical use, and will be implemented on a large scale. So, there’s a lot of hope, but I don’t think it’s as simple as saying that there’s one solution that will solve it all. Now, you never know. You could see a breakthrough that happens. The important thing is – imagine if we lived in a world where everything and everyone was completely free and available. It doesn’t mean that war and hunger and all these other things go away. There are other limiting factors that we could run up against. So, in some ways, we really want to leave it as a silver buck shot approach, because each solution also has some level of problems. One of the more interesting [approaches] that we saw was high-oxygen kites being flown off of the San Francisco California coast. They’re really cool! You’ve got these giant kites that basically aeroform. They’re like wings of planes that fly a thousand, two thousand feet up [in the air]. And the wind blows through them, and they generate power, which then comes down a pipelines, shoots through a wire down to the Earth. What’s neat about it is when the wind drops, the power goes back up from the grid and so it stays up like an airplane. Or smart cars that you can plug into the grid, which allows you to start the car, but the car also acts as a [simultaneous] battery for the grid. Or the FULLY electric Coda vehicle that will go on sale later this year in California that will give you 100 miles. What’s amazing about the Coda for me is when you get into the car, it looks perfectly normal. It’s ordinary looking – you wouldn’t even know it’s electric. SPhD: Well, I know one of the causes that you’re very passionate about, and have written about extensively, is poverty and coservation. On the one hand, it’s wonderful to see so many people climing out of poverty in China and India, Southeast Asia, also in Central and South America. On the other hand, with this mobility comes tremendous energy usage and environmental devastation. How do developed countries balance fostering this growth, yet holding these countries accountable for their emissions, for example through cap and trade systems? MS: You know, people just want a better life and that’s just the truth of it no matter where you go. What is surprising, and it even shocked me, was the disparity in energy use between the Western world and countries like India or places in Africa. For my lifestyle, I use between 120-180 100-watt light bulbs’ worth of power all the time. So, about 18,000 Watts of power to power my life. The thing is, if you go to Asia, the average Asian uses about fifteen light bulbs for their life! And the average African even less – five or six. It’s an enormous difference in quality of life. And they want it to be better. There’s more people joining the middle class in India than the entire population of the U.S. The best way we can help these countries make the transition is through economic stability, meaning better lives, happier lives, less war. Because there’s more stability and more trade. So I think the best thing that we can do is really spur innovation and development, leapfrogging technology. The partnership that we have with China, for example, to make batteries, that are a great collaboration, for the Coda car. So the Coda is made in Los Angeles, but the battery is made in China. Poor countries cannot simply abdicate their responsibilities. They’re the ones that are going to be the hardest hit by climate-induced changes. And so they have to play a role as well. SPhD: Absolutely! Speaking of innovation, in the first installment of The Energy Planet, there are a lot of academic labs and private companies that are innovating green technology even as a lot of world governments are wringing their hands about solutions. How do you feel about some of these private companies, like Tesla Motors or the X Prize foundation here in California in enacting innovation and spurring real change? MS: So in making Powering The Future, I thought we’d spend most of our time talking to governments – and we do do that to some degree. Energy ministers in China, and admirals in the Navy. But we found that the most passionate advocates were the private industries and the private sector. To me, that’s a very Western philosophy, but it does apply nicely. I think it’s of huge importance. Look at these big revolutions that have happened in our lifetime, like the digital revolution, and now this new revolution that’s happening with space technology or in human genetics. Governments have to play a role, and that role can be very instrumental, both in thinking about the public good and in spurring innovation through subsidies or tax breaks. But… over and over again, I go to conferences and I come away with this notion that governments don’t lead. It’s people who lead, and the governments will follow. That’s why things like X Prize and these early innovators being out there, maybe a little ahead of the game, are hugely important. It’s exactly how the technology revolution happened with the internet, and I can see that happening with energy. It’s more complicated with energy, but it’s hugely important indeed. SPhD: So, recycling is one of the quickest, simplest and most impactful ways that we can save energy and protect our planet. I grew up in Seattle, a very ecologically-minded city, where recycling was not only encouraged but ubiquitous, so it was ingrained in my life from an early age. But as I travel around the country, it’s shocking to me how many places there still are where the concept is foreign to the point of being anathema to the way people lead their lives. Do we go the way of the Japanese government, where you actually get fined for not separating your garbage, and they end up collectively recycling or composting anywhere from 70-80 percent of their trash, or do we provide some kind of an incentive? MS: I didn’t realize how important that part is to solving the energy puzzle. But, one of my favorite parts of the mini-series was when we were visiting the Empire State Building, and this guy who does all the retrofitting for the building says to me “The greenest buildings are the ones that are already built.” And what he’s saying is instead of building from the ground up, you’re taking what’s already existing and recycling it. So recycling, whether on a grand scale – retrofitting a building or a rooftop garden – or on a microscale, in your own apartment, is really important. I live in Montana right now, and it’s a great town really, but it’s still really hard to recycle there. Especially glass. And I asked them about it and the truth of the matter is that the costs to ship that glass are so expensive, that those costs prohibit recycling on a small scale in my town. It’s a complicated question. We should encourage people to recycle and to encourage their local governments to enable recycling. But sometimes you realize that it does come down to arguments of cost. As long as energy is cheap, artificially cheap (which it is), it makes it impossible to enable recycling and other programs that can make a difference on the scale which you and I would like to see happen. SPhD: You literally traversed the globe to put together this special and you met everyone from scientists, environmentalists, oil workers and ordinary people. Can you recall for us one moment – any moment – from these journeys that really struck you and made an impact? MS: China was pretty incredible. Because I never expected to spend that much time in the cities in China. Usually I’m going out to the countryside. There really was one moment that was very amazing to me. We went out to a little village outside of a town called Rizhao, which is China’s solar city. A city of about 3 million people that’s gone completely solar in most ways. So we went to this tiny little village right outside it, and walked into a tiny little house that a woman owned with her family. There’s five people in the family, and two rooms in the house, and a tiny little bathroom/kitchen. She had a new shower that she really wanted to show me. It was basically a pipe that went from her room into a little private shower area. And it has hot water now because of a solar thermal unit that she’s put up on the roof. And she’ll have it paid off in five years because of the savings. She told me that in the winter, she used to endure a six-mile walk to a public bath house to have a hot shower. And now this [solar cell] completely changed their lives. Meeting her, I understood that the energy revolution is not just for the affluent and the well off, but rather it’s for all scales of life. The other thing I got in China was a lump of coal – and I actually have it sitting on my desk. And whenever I look at that lump of coal, I realize what the need is all about. SPhD: Well, I really appreciate you joining us and giving us some insight into your travels and work. MS: I guarantee you after watching this special, you’ll never eat a hamburger or fly a plane the same way again. ScriptPhD.com covers science and technology in entertainment, media and advertising. Hire our consulting company for creative content development. Subscribe to free email notifications of new posts on our home page.